The strategic partnership agreement, still under discussion between Washington and Kabul, will govern American involvement in Afghanistan after the deadline for the exit of foreign combat troops by the end of 2014. According to President Hamid Karzai, Afghanistan is also negotiating similar agreements with Britain, France, Australia and the European Union. Afghanistan wants the US and Nato to agree to stop carrying out night raids on Afghan homes as a pre-condition to the Kabul signing a strategic partnership with Washington, President Hamid Karzai said. And if Washington meets demands such as these, Karzai said Afghanistan was prepared to host US troops in the long-term. Karzai also reassured Afghanistan’s neighbours, many of whom are concerned about a long-term US influence in the region, that any strategic partnership deal would not hamper relations with them. 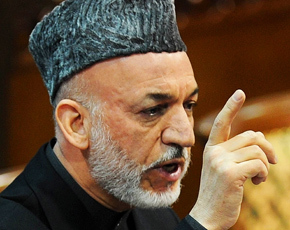 Despite Karzai’s assurances, will a strategic partnership in fact obstruct Afghanistan’s relations with its neighbours? In your opinion, will the US agree to stopping night raids, which they claim are one of their most effective weapons in the fight against insurgents? And in the case where the US does agree to this condition, how much of this will be actually implemented? strategic partnership with US is important for improvement and bringing peace and stability of Afghanistan. so, it is very good step toward stability in Afghanistan. Of course afghani has to decide the future of there country.but Afghan problem can only be solve by afghani.foreign troops in any way or shape will prolong the gurella war and the suffering of afghan peoples.there is unique ruls apply in afghan/pashthun culture.if any person go to the next village with out invitation.the local peoples ask that person,tha da cha melma ye?or u got any business here?let a lone the foreign troops.it,s not in there nature to accept out sider.as long is geo poltics is concern it,s going to make the troops race in the region just like a arm race.what if china ask pakistan can I deploy and keep some troops at Gowadar port?so it is recepie for tention in the region.Let afghan decide there own destiny with out any foreign interferece. I think US is no more interested in Afghanistan now.yes they will keep some army in Afghanistan after 2014 but they can not assure what karzai wants-a next term.Apart from that Taliban are still very strong and will not negotiate until US pledges to leave Afghanistan.So its not about the karzai’s decision that US should have to stay or not many other forces are operating inside Afghanistan. The decision will be taken by Taliban who still control 60% of Afghanistan. It is also reality that US is facing the worst economic crisis of its history and many people in the US itself are questioning whether their country is building Afghanistan or US. We can not ignore the Occupy wall street which have its causes in the economic crisis. So US will decide what will be better in its interests it will not consult Karzai in this matter that whether they have to stay or not. Y does the US Want a base in Afghanistan? Did they not come to kill/capture Osama? They did that. Now y dont they leave? If nations or communities in any region bicker, other powerful groups will come in to interfere. China, Soviets, the US. What is new in this? Haven’t you heard “Do Bandaron ki Kahani?” India and Pakistan are the two bandars. USA involvement all around the world is not a naive or sole example and her involvement in Afghanistan is a risky game Afghans have never be won or forced by any power permanently, but if Afghanistan have to concern about the regional power despite of solving or looking for its own interest it is not logical on the basis that all the neighbour states of Afghanistan always put their own selfish interest and made the country a hell for example USSR invaded it and Pakistan, Iran and even china supported and groomed factions for their proxy wars. so Afghanistan and Afghans have a full right to serve her own interest only. Afghanistan is a sovereign state and has right to sign, on condition that this pact wont hurt Pakistan or Iran. Afghanistan has invited elders and politician how they avoid US not to hurt Pakistan and Iran, if they stay in Afghanistan. I am sure, as i see, Afghanistan’s pact will not damage and hurt Afghanistan relation with their neighbors. besides that, Afghanistan has may need to sign to avoid any neighbors intervention inside Afghanistan, as they had suffered in the last 3 and half decades. hopefully it won’t hurt relations with neighbors. Karzai forgot it was US-EU that put him to power. He can call himself Lion or even GOD, it’s irrelevant !US-EU (NATO) will decide how things will be run in Afghanistan, not Karzai or anyone else. What should Afghanistan do? When the state collapsed after fighting Soviets and defeating it, no body helped. Not only that the neighbors did not help established a central state, but created and supported conflicts inside Afghanistan. where were these regional countries and their cooperation by then? We know Americans are not the best option and source of stability, but we have also experienced our neighbors. It does not matter what you and I think, say or do, the big powers that control economies, armies do control, manipulate and run things. All we have to do is look at history, but as usual the bigger you get one day your day will end just like all the old powers to be. In the meantime poor people,countries and races will be destroyed and trampled under their feet. No matter what you say, there will always be a clash of civilizations/beliefs/live styles. No, America will do what it wants to do, too bad so sad for the downtrodden, they will be greedy and their justice will fit the meaning of the day. Look at the corrupt regimes that are being fronted by them, they give them money,power and then when their use is over they take their money and power back and then let their own people kill them, a lesson that the greedy kings,presidents for life and leaders never learn. We need to make our own decisions and live within our means, when you play with big boys then this is what you get. It is a very good move by the americans.By doing this USA can prevents the repeat of the post USSR withdrawl instability happening again in this unfortunate country.Like south korea,japan,west germany it can bring political stability and economic revival in this war ravaged country.USA can effectively controll the terrorist activities orginating from afganistan as well as neighbouring countries. What is the logic to believe that US or any imperialistic power has any genuine interest in the occupied country especially an Asian Muslim country like Afghanistan? It has its own vested interest in occupation. In this case it is apparent that they want to surround the Iran and procure the oil according to their own terms and conditions. Natural assets of Afghanistan is an additional bonus. Is it not high time that the Asian countries see through the US game, end up their petty differences (Shia/Sunni/Hindu/Christian etc) and unite for more regional cooperation and resist imperialistic exploitation? I fully agree. Regional understanding is the only answer. The US doesnt need afghanistan to encircle Iran. They can easily do that with warships in international waters in the persian gulf. The US has spent more in afghanistan than they can ever hope to get from afghan natural resources. I’m not saying that the US is a fair player, but these conspiracy theories just show the way you think. The US leadership is not the long term, strategic thinking leadership that conspirators make them out to me. USA is not in Afghanistan for making strategic partnerships. It has many long term plans but no plans for strategic partnership. Now every sensible person with a little bit if IQ can confirm this. Second who is Karzai to stop USA from night raids. If he holds any power then he should pressurize USA for NO raids at all. Though it up to Afghans to decide what they want to do with their country but unfortunately this is now a a regional problem and the neighboring countries have high stakes in Afghanistan and that too, is partially due to Afghanistan’s own mistakes. Now they cant suddenly ignore their neighbors and take a solo flight. Long term American presence in the region is a recipe of disaster for the regional peace and their departure alone will solve this complicated problem. If the relationship between US and Pakistan cannot be of equals, can the relationship with Afghanistan have any semblance of equality ? It will be a sham relationship. The US is there only for creating mischief on earth. It will find a minority of favorites and sprinkle some favours on the poor and corrupt to sell the majority, sell their faith, sell their interest and sell Islam. Mr. Ibrheem. Your statement”sell their interests and sell Islam” You muslims cannot even get together to protect your faith and you blame others? Who are the taliban that are creating trouble in your country and Afghanistan? Are the they muslims? Do muslims kill innocents and blow up girls schools? We know they are nothing but extremists but are the authorities in your country willing to accept that? Allah gave you muslims everything. Take Indonesia. A huge nation with natural resources galore. Fertile land bigger than India, oil, gas, coal, timber, tin. You name it they have it. Yet it is struggling. Take the middle east. Oil and gas making billions for them. Most of them are in trouble. You have gas and oil in baluchistan yet your government cannot full exploit it. The only thing you people are good at is quoting the Quran and your religion. Well religion is not going to feed you. That is your biggest problem. The world will leave you muslims behind and you will spend your days lamenting that the world is debasing muslims. Afghanistan needs US support in bringing stability. As a stable Afghanistan benefits Pakistan, so Pakistan should not be worried. In 1972 when Pakistan was fighting India, we had the opportunity and means to attack Pakistan, but we didn’t, Afghanistan is not and will not be a threat to Pakistan, we are not enemies we are brothers complementing each other. US presence is itself the biggest cause of disturbance in region. With unstable Afghanistan, its neighbours cant expect to be peaceful either, espacially Pakistan. US with grand designs of containing China and dominate Central Asia is not a good development for the regional stability. Its definitely in the interest of Pakistan to encourage and facilitate peace in Afghanistan, a stable and democratic Afghanistan is in the benefit of all, regionally and internationaly. Pakistan has ingredients to become a very strong country only if its leadership (civil & military) is honest, serves only the national interest and not the interest of the foreign backers. Any type of alliances in the region will become footnote in the history of economic prosperity, pride and dignity which our nation yearns and richly deserves. We need honest and patriotic leaders not keepers of foreign interests. Afghanistan is a sovereign country and has full right to make agreements with any country they want! Pakistan should not worry about it because we too had CETO and CENTO partnership agreement with US. Afghanistan is a weak nation at the present and she is urgently international support to bring stability. A peaceful Afghanistan is more important for Pakistan. Pakistan has a right to take counter measures to the build up of a hostile neighbour. Pakistan has a right to protect its interest. And USA has right to protect its interests. Why you complaining US presence ? Three questions have been posed. The answer to the first is, ‘yes, it will.’ Iran has already cautioned,. China may not be too far behind, To the second question the answer is ‘no.’ America will not budge from what it finds serves its interests better. And it believes that night raids do. Even if the US agrees it will be cosmetic.